The Australian Shearers’ Hall of Fame honours shearers whose skill, character and contribution to the shearing industry has been exceptional. 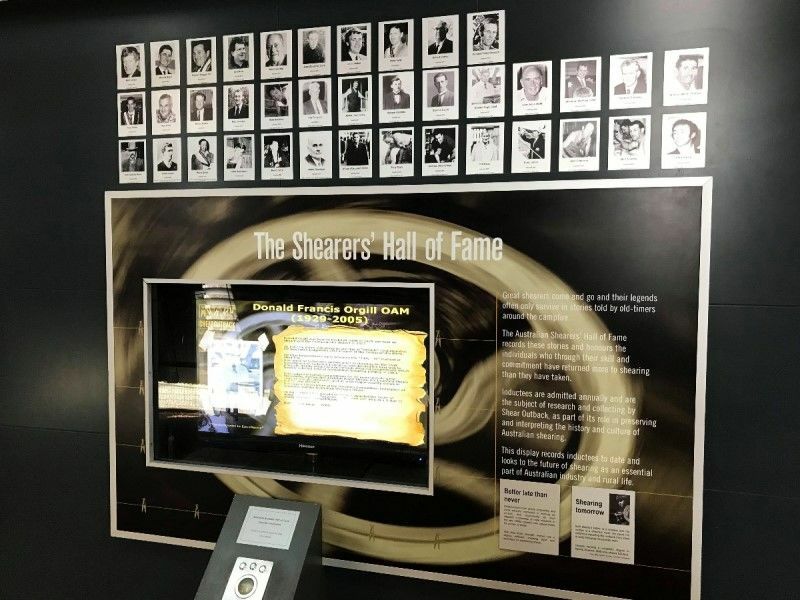 The concept of the Australian Shearers` Hall of Fame, was conceived in 1997 by a committed group of individuals from Hay, who believed that the contribution of Australia`s Shearing Industry to the country`s folklore, culture and economy should be recognised. Great shearers come and go and their legends often only survive in stories told by old-timers around the campfire. The Australian Shearers Hall of Fame records these stories and honours the individuals who through their skill and committment have returned more to shearing than they have taken. Inductees are admitted annually and are the subject of research and collection by Shear Outback, as part of its role in preserving and interpreting the history and culture of Australian shearing. This display records the inductees to date and looks to the future of shearing as an essential part of Australian industry and rural life. Donald Orgill was born in Rockdale NSW in 1929 and took up shearing in the Cootamundra district in 1953. In 1967 he shore 236 sheep in one day at "Hillside" Cootamundra. He was twice judged the best shearer at the Cootamundra Show. He later helped Kevin Sarre promote the "Tally-Hi" method of shearing. Don went on to become an instructor in shearing for the NSW Department of Technical Education and decided the best way to promote quality shearing was through shearing competitions which led him into the field of competition shearing judging in 1964. Don judged shearing competitions for 30 years including the Melbourne. Sydney and Adelaide Royal Shows, the Diamond Shears competition at Longreach, and at most major country shows in N.S.W. and Victoria. Don was a life member of the Shearing Competition Federation of Australia and the Australian Workers Union. 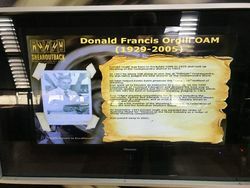 In September 1994 Donald Orgill was awarded the Order of Australia Medal for "Services to the Wool Industry as a Judge of Sheep Shearing Competitions". Don passed away in 2005.